Carolyn's Barbecue Beans are a must every time we have a big family BBQ or gathering. 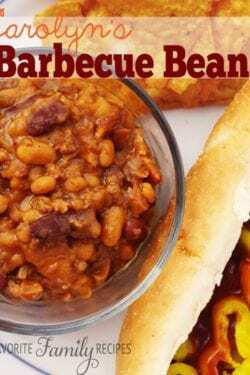 I have had other BBQ beans but these are hands-down my favorite! Fry bacon until crisp. Drain on paper towel. Pour off grease from pan and brown hamburger, onion and garlic. Pour off grease again. Mix all remaining ingredients, except beans, in a small mixing bowl. Add to the hamburger along with the bacon, crumbled. Drain kidney and butter beans and add to mixture. Add pork and beans to mixture, do not drain, and mix well. Cook in crock pot on high 1-2 hours or on low for 4-6 hours.